A couple of weeks ago we did up a blog post on exactly how we thought Bruce, the former Gold winning Olympian, became Caitlyn Jenner a beautiful woman, you can read all about the facial analysis of how Bruce became Caitlyn Jenner here. People seemed so interested with the phenomenon that is the Kardashians and the Jenners that we did a video to explain it a bit more (or just for those of you who don’t like reading!). If you watch her new documentary ‘Call me Cait’ you will that she actually has quite natural looking feminine features. As mentioned in the Video if we focus on her face, Caitlyn more than likely got a combination of the following. 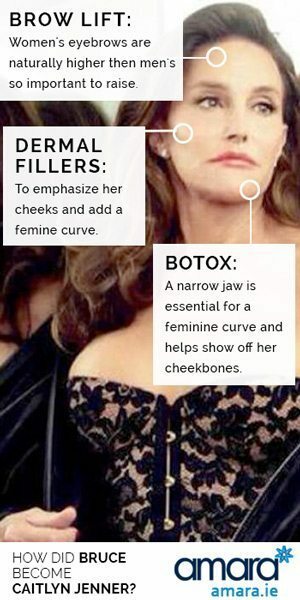 To emphasize her cheeks and to add a curve to the face Caitlyn likely used Dermal Fillers. Men tend not to have a curve to face but are more likely to have a square shaped face so some cheek fillers helped to feminise her face. Women’s eyebrows are naturally higher than men’s (think of a furrowed brow). Caitlyn looks like she has gotten a Brow Liftwhich is combination of Botox and Fillers. The eyebrows tend to be one of the first things we notice about a person and would also be a dead giveaway when it comes to gender. This also gave her significant rejuvenation making her look much younger than her 65 years. A Narrow jaw is essential to have a feminine looking face and would also show off her full cheekbones. There are surgerys to narrow the jaw bone however a much more practical way is to use Botox to weaken the muscles in the jaw and allow a tear drop shape to take place. What do you think of the transformation of Bruce into Caitlyn? Do you think we are missing anything that she has done on her face? If so leave us a comment to let us know what you think!